Hiya guys! I'm officially in that state of mind where I am over this season. Like bye winter you can go now and please take all this snow with you. And it's not even about the cold, I actually love the temperature (and no sun is always a plus because I'm like an ancient vampire or something). But one thing that can stay is all the beautiful themed polish. Neons are nice, pastels are cute, but I live for the vamp rich colors of the winter. 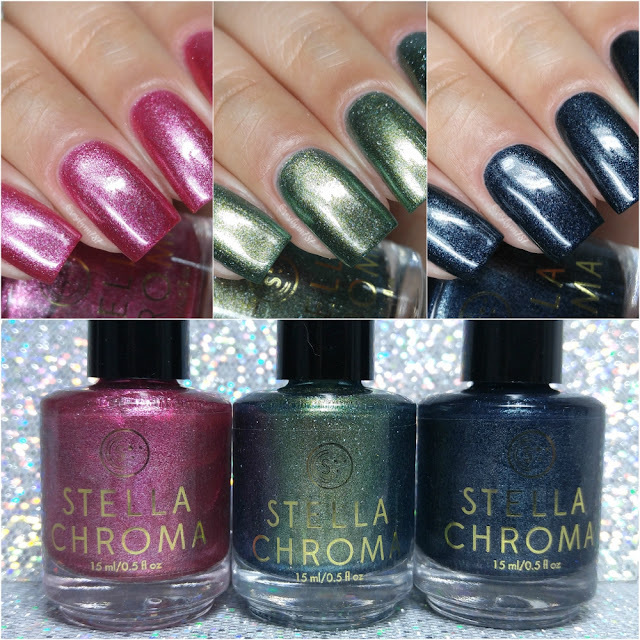 Speaking of which (insert seamless transition here)... Today I'm sharing swatches for the Winter 2018 Trio by Stella Chroma, which is inspired by chilly scenes of winter. If you're in the mood for shimmer (which is a 24/7 mood if you're me) then you're going to love these! But I'll let the polish speak for itself, let's get to the swatches. The Winter 2018 Trio by Stella Chroma will be releasing Friday, January 19th at noon EST. Each full-size 15mL shade will retail for $12. The trio set will be available for $33, which is a discounted rate through the end of January. Winter's Blossom can be described as a bright pink with a shimmery silver finish. If you're like me then you probably need a second to wipe away the drool. 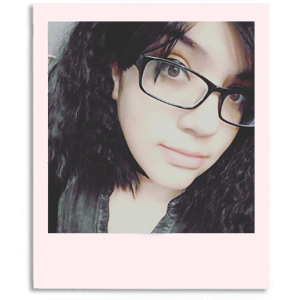 This actually ended up being my favorite shade amongst the three and my pick as must-have. Yeah... I was quite shook as the kids say. Pink shades are never a favorite of mine, but this one is so stunning it won my over instantly. So much so that I ended up wearing this shade for over a week, which for a polish addict is a lifetime! The formula has a very sheen application, but it ends up building up quite nicely for full coverage. Consistency wise it's well balanced, not too thick or too thin. It dries down to a gorgeous smooth and reflective high-shine finish on its own. I experienced no staining on removal to either my cuticles or nail beds. And even though this shade is packed with shimmer I didn't have a hard time during removal, which is always very nice because I hate having to scrub my skin. Shown in two to three coats and sealed with a glossy topcoat. 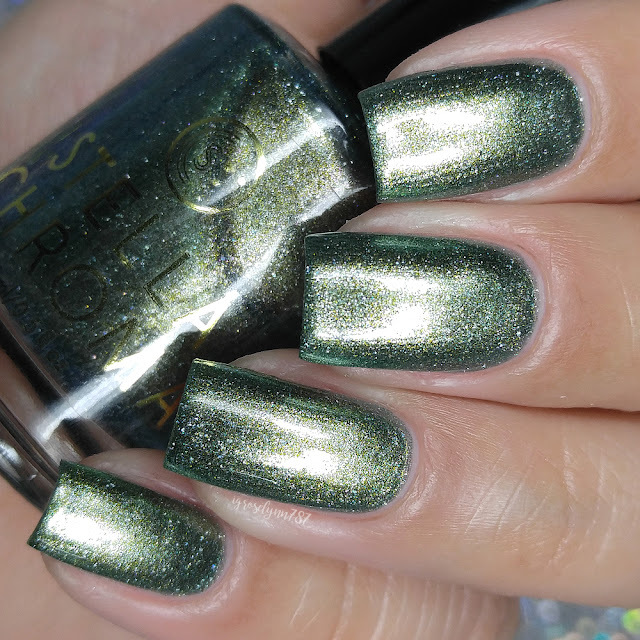 Winter's Frost can be described as an icy green metallic polish with a bit of a blue tint and holographic flakies. Dare I say... I love this one too! It's very different then most polishes in my collection and of course so reflective. I always get such a joy when a polish color I stray from turns my preconceived opinion around. It brings out all the pelvic thrusting! Seriously though, it's a stunning shade and it compliments my skin-tone so well. The formula has a sheer application that builds-up evenly for full coverage. Nice balanced consistency, not too thick or too thin. It has minimal brush strokes in the finish as expected, but they blend out really well as it dries. Smooth finish and high-shine as well. I was so afraid the metallic finish would be hard to pull of, but easy formula definitely makes it easy to wear. Shown in two coats and sealed with a glossy topcoat. The formula has a pretty opaque application, but not enough to be a one coater. Again showcases the nice balanced consistency like the others here. It's very easy to work with and layer for coverage. It dries down to a smooth high-shine finish on its own. No staining here on removal here with, double woot. Shown in two coats and sealed with a glossy topcoat. Overall this is a stunning collection that captures the season perfectly without falling into any niches. Of course, my favorite is Winter's Blossom and it's a must-have from this brand. 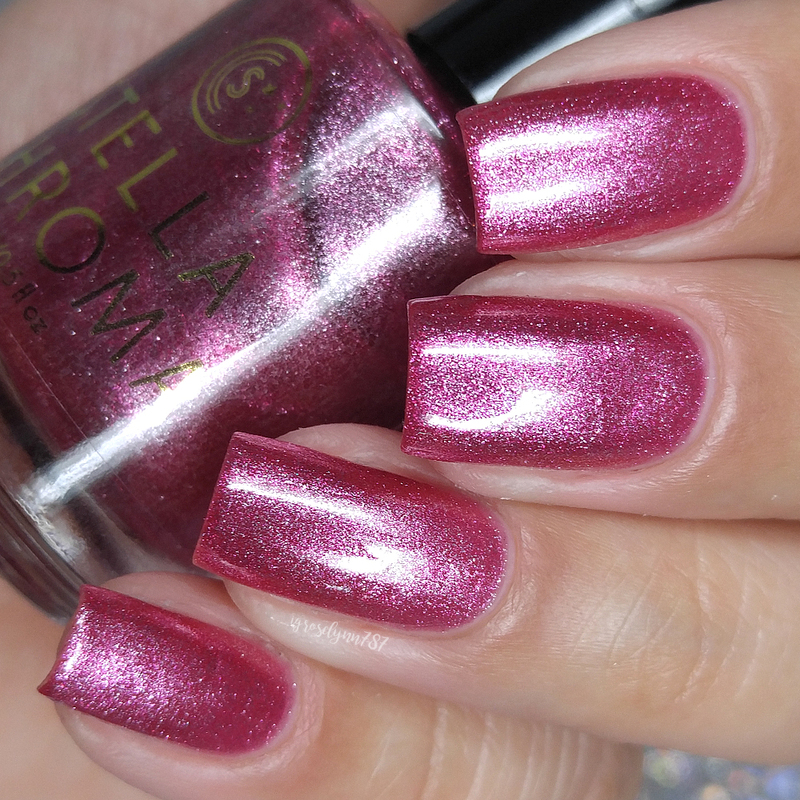 Absolutely one of my favorite pinks I have ever worn and you guys definitely need it. Like now. That said, this is probably my favorite collection to date from this brand. It's very fun and different, plus amazing formulas make the colors that much better! What do you guys think? Tell me your favorite in the comments below. To recap, Winter 2018 Trio by Stella Chroma will be releasing Friday, January 19th at noon EST. Each full-size 15mL shade will retail for $12. The trio set will be available for $33, which is a discounted rate through the end of January. The entire collection is stunning. Such beautiful colors. I think if I were to pick one as my favorite, it would have to be Winter's Frost.